Young people are completely excluded from the political scene in Yemen, unless they come from political families, and nothing could enhance their political participation except the solving of the many urgent problems they already face. That was the main theme of al-Hewar Foundation for Democratic Development’s (HFDD) seminar, titled “Youth and political parties…from a Yemeni perspective,” that was held last week. 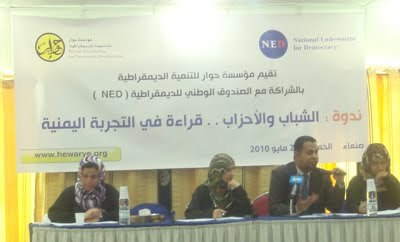 The seminar was conducted in cooperation with the National Endowment for Democracy (NED) in a continuous attempt to enhance the democratic nature of Yemen’s civil society and Yemeni youth’s political involvement. 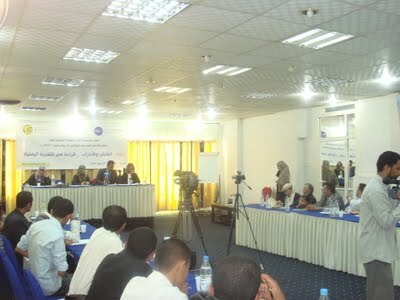 The seminar targeted personalities from several political parties, youth from NGOs, humanitarian activists, intellectuals and journalists, aiming to provide close insight into Yemeni youth’s current political participation. The attendees agreed unanimously that young people’s political participation is weak or negatively orientated. “Sadly, political use of youth only occurs during election times, simply attracting them to fulfill the parties’ main hidden goals,” she added. The seminar also pointed out that political parties must focus on the Internet, where youth find most of their information. “It’s very notable to find political parties’ websites very insufficient and deserted when the youth today depend on the Internet for almost everything. Therefore, political parties are not fully talking advantage of current technology that is crucial to educating youth about how and where to participate politically,” said Suha. “All I want to say is that youth are the nation’s treasure and, in particular, they are the political parties’ treasure too. If we don’t use them for the better, political parties will disappear and youth will become tools for terrorist attacks, just like what happened in the recent suicide bombing on the British embassy, where a young man was easy prey for terrorism and blew himself up, ” she added. The seminar also stated that, on the one hand, the fact that youth are avoiding participating in political parties could be helpful but, on the other hand, it’s damaging if they are avoiding political participation completely because complete inaction forms a bleak future for the future political situation of the country. It’s not only the responsibility of the political parties, but also all concerned institutions. They must enhance political progress within all Yemen’s governorates. “After all, family upbringing has to be democratic so that the coming generations, who are tomorrow’s citizens, are more politically aware and think about politics as a necessity, not an extravagance, “ concluded Rana.